Come face-to-face with wildlife in the Serengeti Wilderness Area. After meeting you at Kilimanjaro airport we will have an overnight stay in Arusha, the jumping-off point for many Tanzanian safaris. We begin the trip with a bush safety and familiarisation phase, including a special guided visit to a local snake and reptile park. 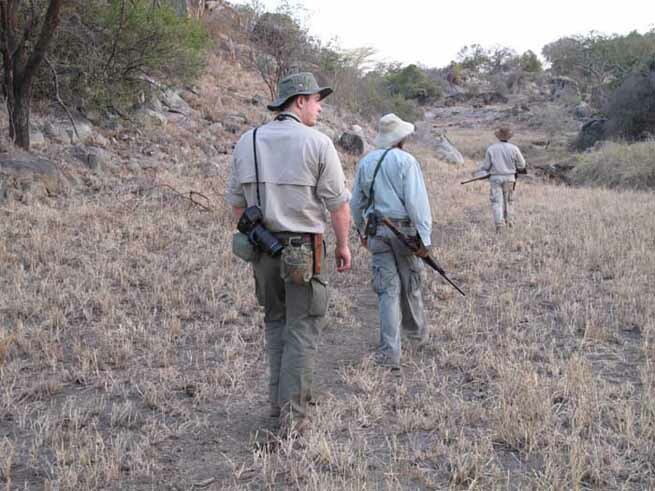 Your initial orientation is continued at a private game reserve where we will cover further safety and survival skills. Here, we will also begin training in local animal identification and tracking. We will camp here in the same style of lightweight camp we will use in the Serengeti. This gives you the chance to get yourself and your equipment organised for this style of safari before enjoying the more comfortable accommodation at Mysigio. On day 4 we travel to the Ngorongoro highlands. Here we will stay in the Mysigio seasonal camp, which provides a little more comfort for a few days. 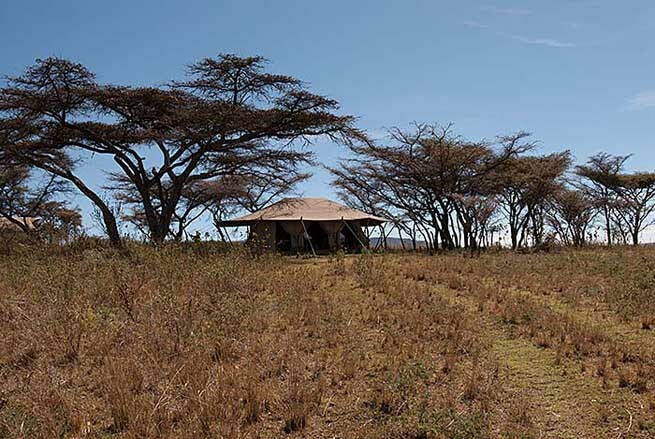 The camp is situated inside the Ngorongoro Conservation Area, in a grove of ancient acacia trees on a ridge with stunning views over Lake Eyasi. One of the fantastic views from Mysigio Camp, Ngorongoro highlands. Our safari partners have gone to great lengths to develop an environmentally minded camp - all lighting is solar powered, water is used sparingly and recycled fuels are used where possible - the result being the lightest of impact when seasonally moved from Ngorongoro. One of the great benefits of Mysigio is the fascinating interaction with the local Massai community. African Environments, our partnering safari company have had camps in this area for nearly 20 years and have established a close relationship with the village, helping to build classrooms and recently a library for the local school. Through this close relationship we are able to offer clients a unique and honest insight into the Massai lifestyle and culture. A unique and honest insight into the Massai lifestyle and culture. While camped here you will spend time with Massai, learning about their way of life and knowledge of the African bush. In addition to being able to participate in various activities with members of the tribe, you will have the opportunity to spend time with and engage in meaningful discussion with the elders. 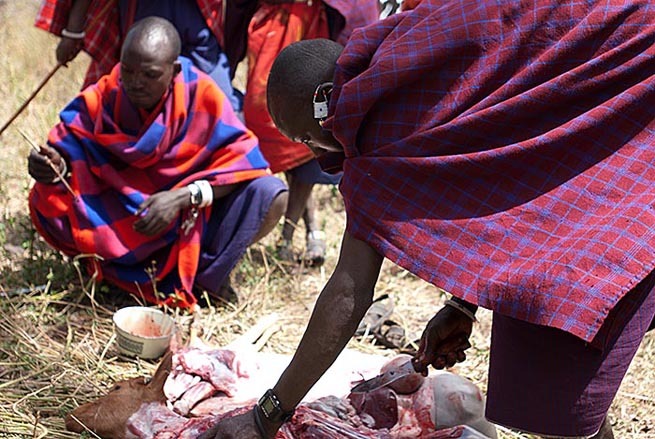 As herders, the Massai spend a great deal of time with their animals in the bush. They not only have to defend themselves from dangerous animals but also ward them off their herds. This gives the Massai a great understanding of the wildlife that can be encountered. We will make use of this knowledge during later stages of our safari. 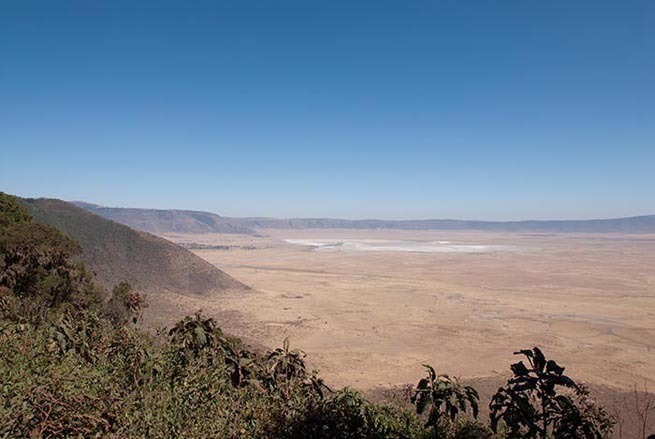 A further advantage to Mysigio is as a fantastic base to visit the Ngorongoro crater. This huge volcanic crater is world-renowned for its concentration of African game and is one of Africa's top safari destinations. It has the densest known population of lions. We will make a full-day's excursion to the Ngorongoro crater while based at Mysigio. 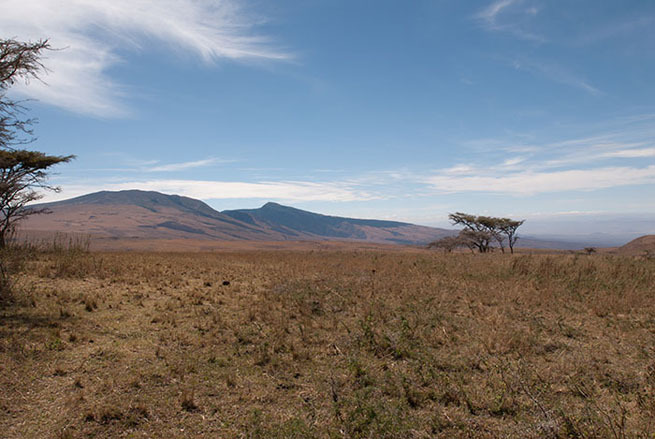 The Ngorongoro crater is world-renowned for its concentration of African game. Having camped overlooking Lake Eyasi, we then descend a rough 4x4 track to the forests that line the shores of the lake. Here we will rendez-vous with the Hadza, one of the last tribes of hunter-gatherers in Africa. The Hadza are always busy working on their bows or arrows. 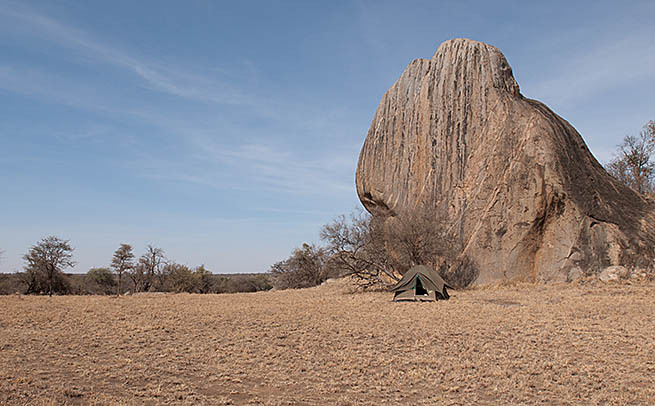 We will set up a lightweight camp near to one of the Hadza's camps and then spend the next few days with members if the tribe learning about their way of life and the bushcraft skills they use to survive on a day-to-day basis. This is a rare privilege and, for us, one of the major highlights of the whole trip. The Hadza have such a detailed knowledge of their environment; spending time with them in the bush provides a unique insight not only into their way of life but also what it means to be a hunter-gatherer. The Hadza live day to day through their knowledge of the bush. 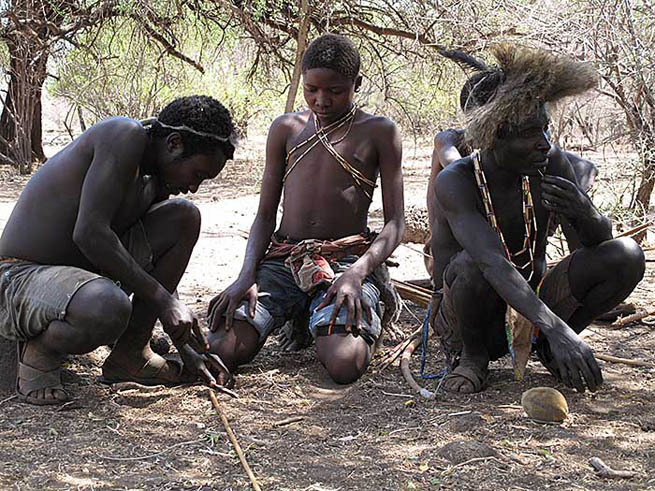 As with the Massai, you will learn from the Hadza valuable indigenous knowledge of how to look out for and avoid dangerous animals in the bush. 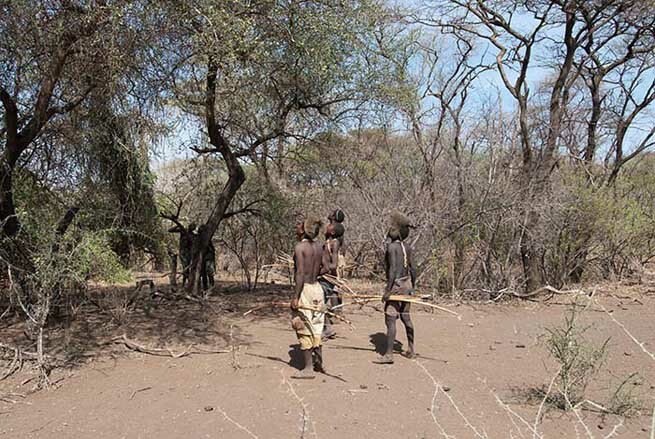 In recent years the Hadza have come under increasing pressure by competing land uses, including hunting concessions and pastoralism, that are impinging on their traditional lands. In visiting the Hadza in a sensitive way, with small numbers of people, to learn from them and about them, we hope to support the way they wish to live their lives. We also hope that our interest demonstrates that the Hadza should not be looked down upon or marginalised by their neighbours or their country's government. This is a unique opportunity to engage with these wonderful, friendly, knowledgable and skilled people who are living a way of life that is almost extinct on our planet. Learning first hand from the Hadza is an enourmous privilege. After leaving the Hadza we head for the Serengeti National Park, a jewel in the safari crown. The lower elevation of Lake Eyasi means the conditions are likely to be hotter than the remainder of the trip while we are with the Hadza. The Hadza are used to this environment while we are not. Keeping up with the Hadza on bush walks and dealing with dry heat can make this a tiring phase of the trip. Hence, after a few days at Lake Eyasi in the light camp, we will overnight at African Environment's Serengeti Main Camp. This will give you chance to freshen up and spread out a little more. On day 10 we enter the Serengeti Wilderness Area for the culmination of our trip - a walking safari in the Serengeti. The Serengeti National Park - a jewel in the safari crown. For almost half a century walking in the Serengeti was not permitted. A couple of years ago African Environments, our safari partner in Tanzania, approached the park administration about utilizing the vast Wilderness Area to run low-impact walking safaris. 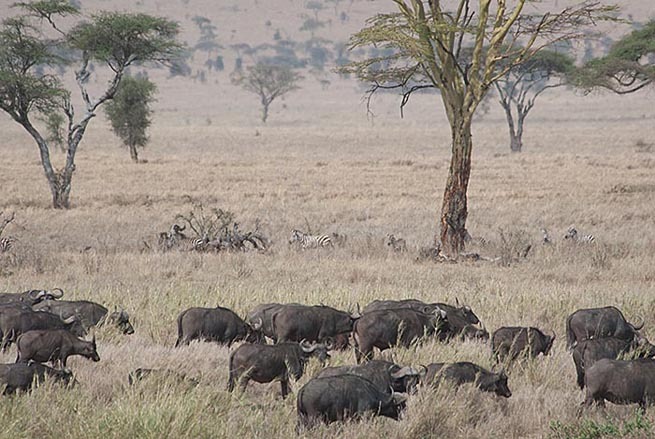 They were successful in their proposal and even today, there are still only a small number of companies permitted to take limited clients into the pristine areas, otherwise excluded of the normal Serengeti safari traffic. 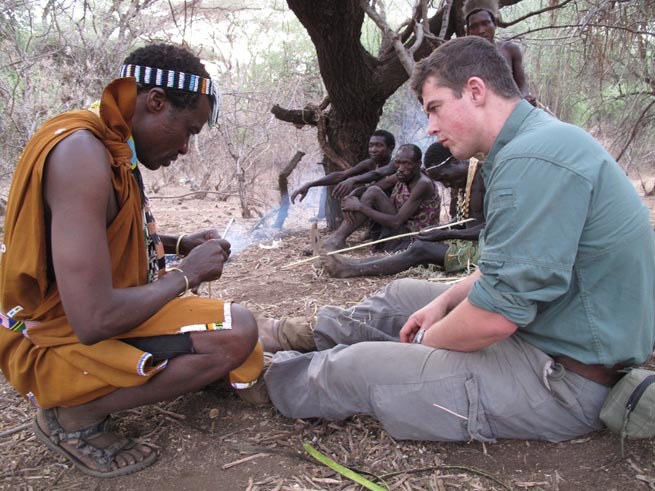 Frontier Bushcraft has teamed up with African Environments to provide a unique walking safari. 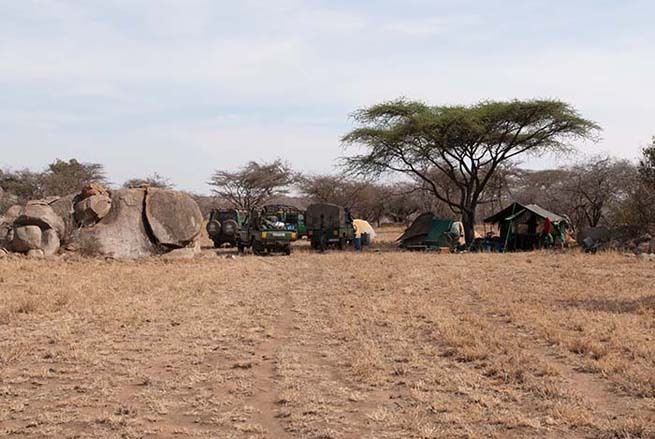 Combining African Environments experience as the pioneer of Serengeti walking safaris and Frontier Bushcraft instructors' experience in tracking training, this is a rare opportunity to get out on foot in the African bush and learn and apply tracking skills in an environment where they fit perfectly. On foot in the Serengeti. For the purposes of safety while we are on foot in the Serengeti, our head safari guide will be armed with a rifle. We will also be joined by a Serengeti National Park Ranger, who will also be armed with a rifle. Distances walked are not huge. The walking safari is about moving slowly and immersing yourself in the African bush, about sitting in the cool shade of a tree and watching animals come down to a waterhole to drink, about creeping ever so slowly up to a herd of impala, feeling their eyes on you and listening to their warning calls to each other. And, at the end of the day - when lying in your camp bed listening to the lions roar and hyenas laugh - you will relish the fact that there is no one else within 30 miles. 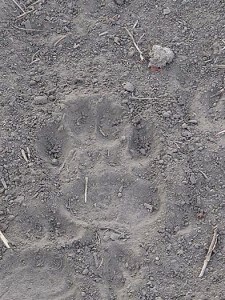 In the morning we can rise to read an account of the night's activity in the animal tracks around the camp. Sunset in the Serengeti with no-one else around for miles. Serengeti Walking Safaris are a privileged experience open to only a few adventurous souls and are a thrilling finale to our Tanzanian Bushcraft Safari. On leaving the Serengeti Wilderness area we will travel to the grass airstrip at Seronera and fly out of the Serengeti by light aircraft. The plane will take us back to Arusha, where day rooms will be available to clean-up, change and re-pack. 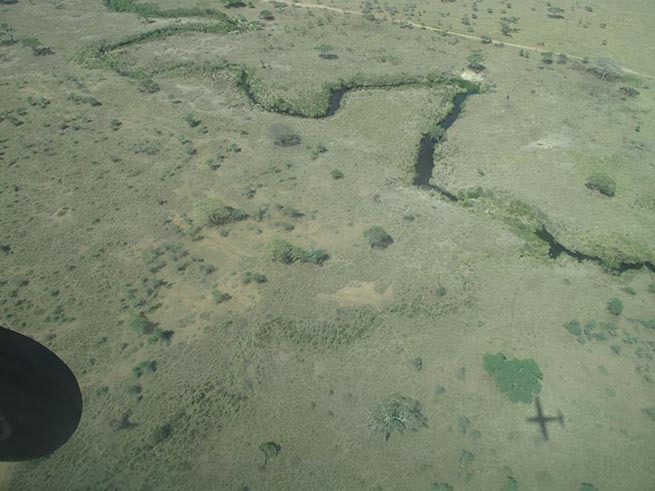 You will take a light aircraft flight out of the Serengeti back to Arusha. 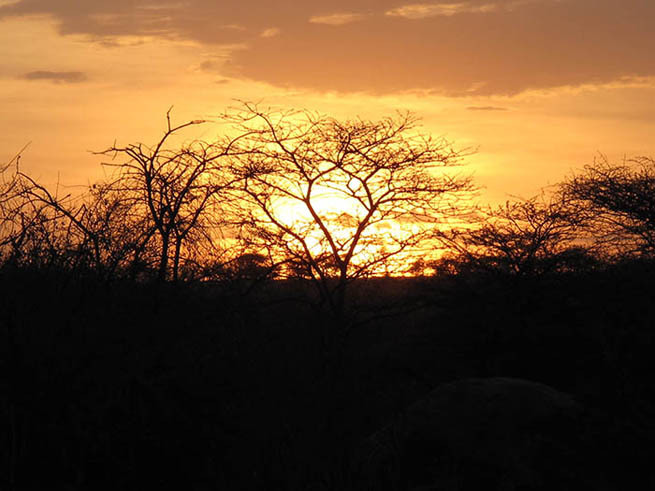 Tanzania lies below the equator so the coolest months occur during the northern hemisphere’s summer. The climate is tropical and all-year round the weather remains pleasant and comfortable, although there are significant regional variations. The coast is warmer and more humid, while the central plateau is cooler and more arid. Between June to October, temperatures range from around 10 degrees Celsius in the northern highlands to about 23 degrees Celsius on the coast. On the plains and the lower-altitude game reserves, the temperatures from June to October are warm and mild. On the coast, these months are some of the most pleasant to visit, with balmy, sunny weather much of the day and cooling ocean breezes at night. During the long rains from mid-March to May, it rains heavily almost every day. There are lighter rains during November, December and sometimes into January. The coolest months countrywide are from June to October and the warmest from December to March. Hence, September/October is a good time for us to visit for our Tanzanian Bushcraft Safari. A full kit-list is available on request. 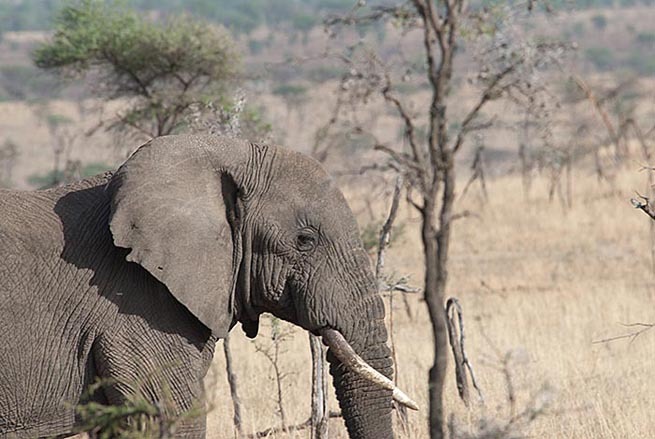 Wilderness Walking Fee for Tanzanian National Parks where required. Lightweight mobile safari crew and vehicles, Serengeti Wilderness Area. Tipping of safari driver & guide (approx $50-$80 per person). For most of this expedition we will utilise a genuine mobile safari outfit, with camp being set up as we arrive in an area and taken down as we leave. The vehicles on our expedition will travel with guides, a small but highly effective support crew and equipment. Using a lightweight mobile safari outfit such as this has less impact upon the environment and allows us visit remote areas we couldn’t otherwise access. Individual Tent at a lightweight walking safari camp in the Serengeti Wilderness Area. On arrival you will stay in a hotel/lodge for one night. Days 4-6 we stay in Mysigio seasonal camp (see Days 4-6 in the itinerary above for further details). The evening of Day 9 we stay in African Environment's Serengeti Main Camp. While in camp the menu boasts a fantastic blend of European and Swahili items with soft drinks, wine and beer included in the price. If you have any allergies, food intolerances or other dietary requirements, please make sure you include this information when you book. There is an opportunity during the booking process to tell us about this. If you book online, this information can also be added or edited later once you have created a log-in and password for our booking system. There are no pre-requisites for the Tanzanian Bushcraft Safari. As long as you are keen, open-minded and enjoy an adventure, then we would be delighted for you to join this expedition. You do not need to have attended any bushcraft courses but any skills you do have - particularly tracking - will be helpful. You will be taught environment-specific skills on the trip.